Bit of a slow month for painting, as RL has been keeping me quite busy. Last night I finally got in my first game of FAD 4. The battle pitted my US forces against my Chinese forces. Here's the initial setup. Chinese forces (me) are on the left and the US (Chris) is dug in on the right. My mission was to occupy the green token that's sitting right behind a crater on the right. Chris' mission was simply to prevent me from accomplishing mine. You can see the problem with my setup immediately. Let's just say I need more terrain! 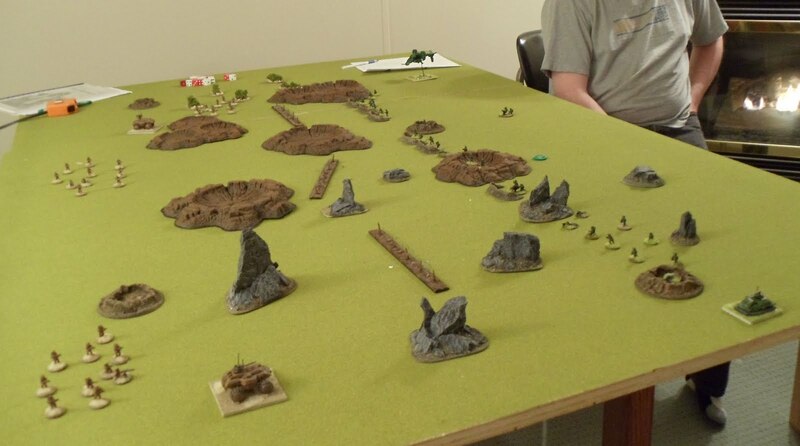 Chris' first action was to call in off board artillery and drop a round right into the middle of my middle squad. And it pretty much went downhill from there. Cover is hugely important. I'm going to have to do some tweaking on the Chinese vehicles and infantry squads as they have a rather noticeable problem when dealing with infantry. This game was a 750 pt game and took us about 4 hours to play, although this was the first time we had played. The Chinese had 30 infantry and 2 vehicles and the US had 30 infantry and 3 vehicles. On my table right now are my trees that I need to build and for painting I have 2 units of Vikings.